How much difference can a hydrating toner really make in your skincare routine? "Not much" is the answer I would have given you just a few weeks ago. Until I tried Lancôme's Tonique Confort I thought that toners were nice to have, but couldn't really be must-haves. So what makes this milky pink toner so impressive? Keep reading to find out! Toner is not a step I ever felt was essential in my skincare routine, and I often skipped it. I did use some acid toners in the past, but they're more liquid AHA/BHA treatments than real toners. I also discovered L'Occitane's Shea toner last winter and thought it felt pretty good on my skin... but it's nothing compared to what Lancôme's Tonique Confort does for me. With its milky pink color and beautiful plastic bottle, the Tonique Confort Re-Hydrating Comforting Toner With Acacia Honey (what a name!) looks very appealing on my bathroom counter. I got a 200 ml bottle but Lancôme also makes a jumbo 400 ml one. Neither is cheap: the smaller is $26 while the large bottle is $46. It's Lancôme after all, and their skincare is priced according to the brand's high end status. The Tonique Confort isn't completely liquid. It has a thicker consistency that's not really a gel, but heavier than a liquid toner. The consistency, the milky look and the potency remind me of an essence, those liquid treatments made by Asian brands that are sort of a hybrid between serum and toner. I feel like Lancôme markets this product as a toner because that's what their Western customers know, but if you're a skincare buff you'd probably categorize it as an essence! It has a subtle rose scent - I'm kind of disappointed that it doesn't smell like honey, but I think the rose fragrance fits better with Lancôme's skincare line. Lancôme suggests applying the Tonique Confort with a cotton pad, but I feel like it's a waste of product. With its gel-like consistency it's very easy to pour a very small amount in the palm of my hand and gently swipe all over my face, neck and decolleté. Because it's not too liquid-y it doesn't drip between my fingers too quickly. Using this method I feel like I get the full effect, without the irritation caused by rubbing cotton on my face. This thing feels SO good on my skin, it's like a glass of icy cold water in the desert. It's refreshing, it's hydrating, it feels like splashing my face with cool water, except that the moisture stays. It leaves my face very smooth, plump and hydrated but not greasy or sticky at all. The amount of moisture the Tonique Confort provides is really what makes it stand out in the toner crowds. It is truly hydrating, more than I ever imagined a toner could be. One day after using it I forgot my serum and moisturizer and went straight for my foundation. I had already applied makeup to my entire face when I realized my mistake, and I didn't have time to remove and redo it. I was really surprised to see that my foundation applied beautifully, and that I had no dry patches or fine lines showing through. My skin didn't feel tight or uncomfortable during the day either. I think that oily skins could get away with using the Tonique Confort as their daily moisturizer! Looking at the ingredients list, I can see why it packs so much moisture: it contains glycerin, hyaluronic acid, yeast extracts, castor oil, and of course honey. Lancôme says that this product is for dry skin, but I think it could work for just about anyone. I personally have combination skin and in the summer it's not dry at all, just dehydrated (which is a different issue, we should discuss that one day). And I absolutely love how it makes my skin feel! It doesn't make my T-zone shiny or cause breakouts. It's not heavy at all either, so in my opinion even people with oily skin could use it as a light hydrator. For people with truly dry skin though, it should be a great way to add more moisture in their skincare routine without having to switch to a heavier moisturizer. 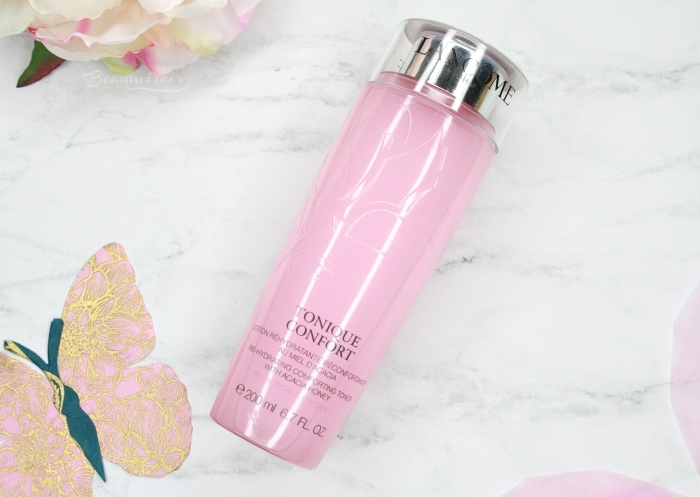 I thought it would be just another toner, but Lancôme's Tonique Confort took me by surprise. It's the best toner I've ever tried, hands down! It provides so much moisture to my skin, yet remains very light and refreshing. I haven't been so impressed with a skincare product in months! I wholeheartedly recommend it to anyone looking to get more hydration from their skincare routine without having to use a richer and heavier moisturizer, no matter your skin type. The product featured in this review was sent to me by Influenster for consideration. I received no compensation other than a free sample to write this post, which only reflects my personal opinion. This post contains affiliate links. I receive a very small commission when you shop through those links, and the money generated covers a small portion of my expenses to purchase products for review. Clicking on those links helps ensure that Beaumiroir continues to publish reviews of new and exciting high end French products - at no cost to you!